Posted July 24, 2018 & filed under VOLCANO DREAMS. Most visitors to Yellowstone National Park are not aware (at first) that they have entered a giant volcano. That’s right. Yellowstone sits above a “hotspot” – a place where molten rock rises up from the mantle into the earth’s crust, close to the surface. 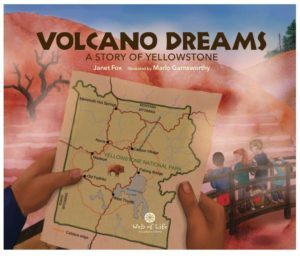 This has created the Yellowstone supervolcano, which has erupted every 650,000 years or so and is responsible for the amazing geologic landscape and thermal features we see today. But don’t worry – there is little chance of an eruption occurring while you’re there! For one thing, these episodic eruptions occur on such a huge scale, with many hundreds of thousands of years in between, that you won’t likely be around for the next one. For another, because Yellowstone is so fascinating and dynamic, geologists have planted instruments all over the region to map its frequent earth movements. We would have plenty of warning of an impending eruption. Even though Yellowstone does experience frequent earthquakes that does not signal a major event. The Yellowstone supervolcano last erupted 630,000 years ago. That eruption formed the caldera edges that you can see today, when the eruption blasted apart the crust, which then collapsed as the volcanic activity subsided. The cooling lava formed some of the most interesting geologic features in the Park. Look for cliffs with columnar jointing, and visit the glassy obsidian rock (which formed when the lava cooled extremely rapidly). There were a number of previous eruption events which have left a trail of geologic clues across Idaho, Utah, and Nevada. The reason for this long “tail” is that the earth’s crust actually moves over the mantle in response to plate tectonics. If you want to learn more about the Yellowstone volcano, I recommend the book Windows Into The Earth by Robert B. Smith and Lee J. Siegel. And if you want to follow what’s happening in Yellowstone all the time, check out this website: https://volcanoes.usgs.gov/volcanoes/yellowstone/ There you’ll see the kinds of instruments that scientists use to monitor the volcano, and discover other fascinating aspects of its geologic history. In the next couple of posts I’ll look more closely at the Yellowstone supervolcano and how it forms the thermal features you can see when you visit.